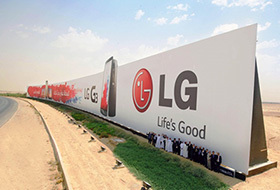 Baton Rouge, LA – October 1, 2014 – Lamar Advertising Company (Nasdaq: LAMR) and Guthrie Green are bringing Tulsa’s first-ever photo-interactive digital billboard campaign to life. Tulsa residents who visit Guthrie Green, an urban park and entertainment space in the heart of Tulsa’s Brady Arts District, will have the chance to be seen on a digital billboard, thanks to a new campaign combining digital out-of-home and social media. As part of an ongoing campaign, those who visit Guthrie Green can share their photos from the park on Facebook, Instagram and Twitter using the hashtag #GuthrieGreen. Select photos chosen by Guthrie Green will rotate on Lamar’s digital billboards in the downtown and midtown area. 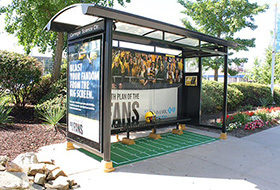 Integrating social media and digital out-of-home is part of a new advertising strategy that is reinventing outdoor and keeping customers engaged in new ways. 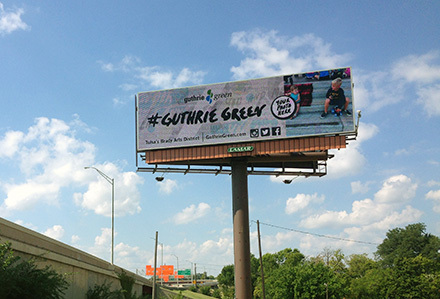 Using Lamar Advertising’s digital capabilities, select photos with the hashtag #GuthrieGreen will be chosen from social media sites and displayed on a network of digital billboards in Tulsa, OK. The digital campaign will run through October 10, 2014. Lamar Advertising Company has more than 20 digital billboards in the Tulsa market. Guthrie Green, an urban park and entertainment space in the heart of Tulsa's Brady Arts District, resides on the square block between Brady & Cameron and Boston Avenue & MLK Blvd. Enjoy concerts, movies, fitness classes, food trucks, and much more at Guthrie Green. All events are free and open to the public! The recently renovated site was previously home to a variety of industrial and commercial uses including Vinson Supply, DX, and, most recently, Central Freight. Visit www.guthriegreen.com to learn more.